You’re at the beach, the sun shines warmly upon you. Your eyes are closed and instantly you fall into a deep trance, feeling absolutely relaxed by the sound of waves washing over you. You’re loving every moment, savoring every single sensation, as you fall deeper into a tranquil and peaceful state. At the same time, you’re also secretly enjoying the sweet innocent voices of children playing with one another, people softly chatting away and buskers singing harmoniously. Aah, sounds like a perfect Summer outing! This edition of Creative Insights is all about having fun in the sun! Come and have a look at this photo montage concocted by our oh-so-talented image editor. Anyway. 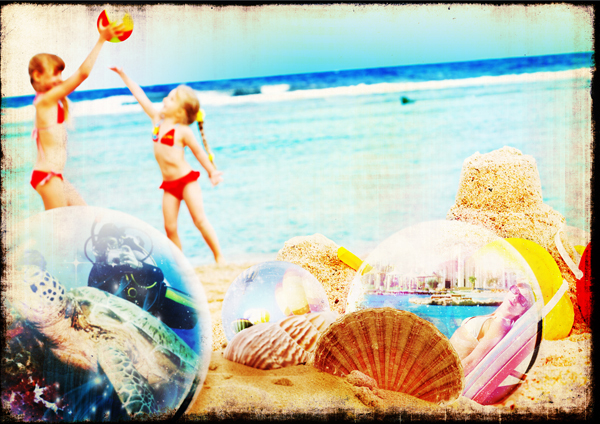 how are you enjoying your Summer vacation so far? You must be busy planning lots of getaways or parties! Whatever it is, we sincerely hope you’re having a Really Fabulous one.